Oats are one of those super powerful and versatile foods that will give you a ton of nutrients and that you can incorporate into pretty much any meal of the day. How about a creamy oatmeal for breakfast, oats in a mid-morning smoothie or oat crusted chicken sticks for lunch or dinner? 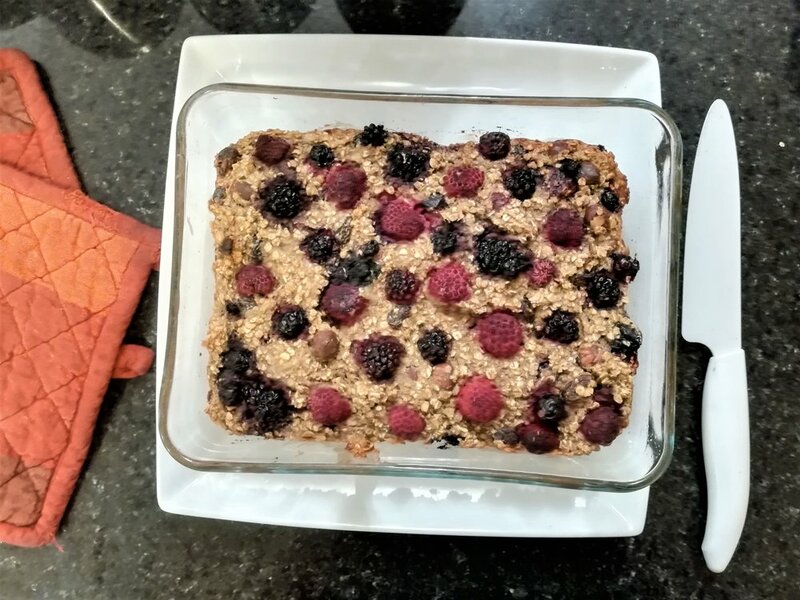 This baked oatmeal works best as a part of breakfast, although you can also sneak it in for dinner, if you fancy something quick that is also filling and will give you and your kids plenty of goodness. Mash banana well and whisk in the eggs. Stir in cinnamon, vanilla, bicarbonate soda and almond milk. Combine with oats, raisins, nuts and most berries (leave a few for the topping) and stir until you get an even texture. If you feel that the mix is too dry, add more almond milk. Transfer into a slightly oiled tray, spread evenly, top with the leftover berries and bake a 175 C for 30 minutes.